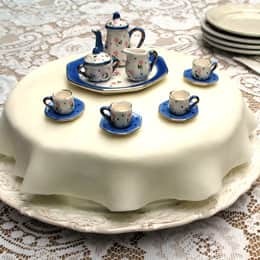 Topped with a fondant tablecloth and miniature teacups and saucers, this layer cake really sets the mood for a tea party. Plus the tea set makes a nice bonus gift for the birthday child. If you haven't worked with fondant before, don't let the thought of it intimidate you. This recipe is made with marshmallows, resulting in a consistency that's easy to roll and will hold together well when you drape it over the cake. Make a batch of marshmallow fondant. First, microwave the marshmallows for 30 seconds to 1 minute to melt them. Stir in the water and vanilla extract until the mixture is smooth. Then stir in the confectioners' sugar a cup at a time. The dough will be sticky at this point. Turn it out onto a surface dusted with confectioners' sugar and knead it, adding more sugar until the dough is pliable, smooth, and no longer sticky (5 to 10 minutes). Pat the dough into a disk and wrap it well in plastic. Refrigerate it overnight. When you're ready to decorate the cake, stack the layers with a layer of frosting between them, and then frost the whole cake. Let the fondant come to room temperature and then roll it out into a large circle (about 1/4-inch thick) on a flat surface dusted with confectioners' sugar. Dust the rolling pin with sugar, too. Trim the fondant into a circle that's 4 or so inches wider than the cakes. Drape the fondant tablecloth over the cake letting the outer edges fall naturally into soft curves. If needed, gently press down on the cake top, carefully smoothing the fondant so that it is flat. Set the table with the miniature tea set. To cut the cake, remove the tea set and use a sharp knife to slice through the fondant. Or, if you prefer, lift off the tablecloth and serve the cake without it. The frosting under the fondant and between the layers makes the cake plenty sweet.